With just 46 days ahead of the departure date, the UK can't clinch a deal. UK yearly GDP was softer-than-expected in 2018, Industrial Production plunged in December. The GBP/USD pair briefly pierced its previous February low of 1.2853 during US trading hours, maintaining the harsh tone ahead of the Asian opening, as the Pound got hit by a batch of negative UK data. The kingdom released earlier today its preliminary Q4 GDP figures, up by 0.2% QoQ as expected, and by just 1.3% YoY, below the market's forecast of 1.4%. Industrial Production and Manufacturing Production were down in December by 0.9% and 2.1% respectively when compared to a year early, also missing analysts forecasts. The trade deficit in December widened to £-3.229B vs. the previous £-2.904B. Most of UK jitters are to blame on Brexit, with little over a month for the divorce date and no progress in a deal that can satisfy both parts. The latest in that front indicates that PM May rejected Labour's leader Corbyn proposal of a customs union, while EU's Chief Negotiator Barnier was once again quoted saying that the deal is not open for renegotiations. BOE's Governor Carney is scheduled to speak this Tuesday, about the economic outlook and global tensions. 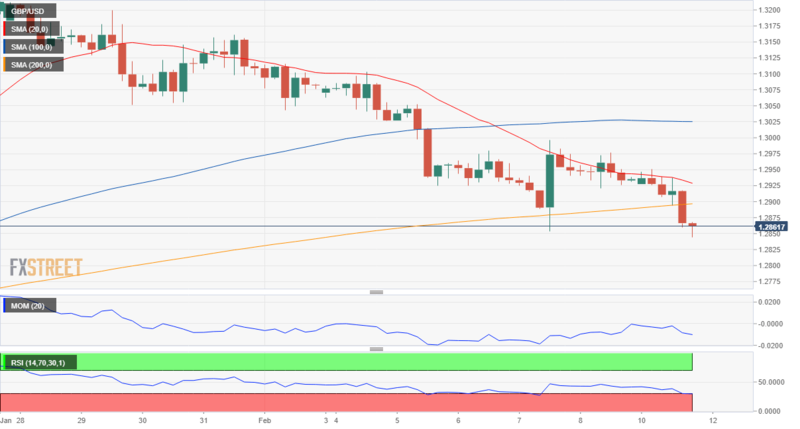 The GBP/USD pair trades at around 1.2850, firmly bearish according to technical readings in the 4 hours chart, as the price finally broke below the 200 EMA, and even completed a pullback to the moving average before resuming its decline. In the mentioned chart, the 20 SMA maintains its downward slope, converging with the larger one around 1.2930, while the Momentum indicator heads sharply lower in negative territory and the RSI consolidates around 27. Overall, the pair is set to extend its decline, particularly if the slide extends below 1.2830, where it has multiple daily lows from early January.